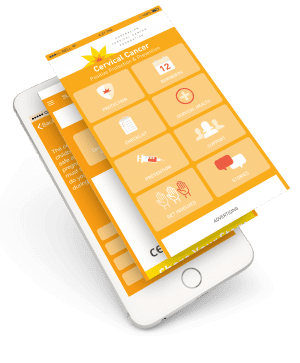 Download the free ACCF App to learn about the cervix, set up a reminder for your regular cervical screening, share your story, participate in a great quiz and more! Available by searching "ACCF" on Apple or by following the link below. Australian Cervical Cancer Foundation’s App aims to promote a healthy cervix and avoid cervical cancer. The App educates women of all ages about their cervix; what it is, its role in the body, how to prevent cervical cancer, the link to the HPV virus, and general tips for regular health checks. It includes a fun quiz to test your cervix knowledge, and a handy reminder service – Get the Text – to ensure women never forget to be screened. It also helps women with support services including a Cervical Health Info Line and an option to read and share inspirational stories through ‘Faces of Cervical Cancer’.